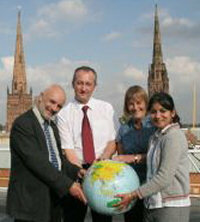 The big wigs at Coventry City Council are pretty serious about climate change. They’ve developed a comprehensive Climate Change Strategy, they have Nigel Lee and Gary Ridley acting as two of the country’s first very ‘climate change councillors’ with specific responsibility for climate change issues, and the website is dotted with inspiring pictures of unidentified council-types enthusiastically brandishing inflatable globes. All of this is carefully constructed to let local residents know that if and when the forecasted climate apocalypse does strike, Coventry City Council will be blameless. Inevitably though, some madcap ideas have surfaced alongside perfectly reasonable suggestions, and today’s Coventry Telegraph reports that the city council has launched a ‘carbon hotline’ for the exclusive use of local authority staff. The 17,000 employees will be encouraged to call the line with their ‘carbon cutting suggestions’, and so it appears that a council offering environmental advice and assistance to private business (via their own team of expert consultants) now need to seek further advice from their completely unqualified personnel. And if a member of staff does suggest a decent carbon cutting measure, their reward won’t be limited to the warm fuzzy feeling that comes from helping the environment; indeed, all accepted suggestions will result in a hard cash award for whoever proposed the measure. The council haven’t said exactly how much, but Nigel Lee casually suggests that it could be a ‘percentage of the savings’. So taxpayers pay for the hotline, they pay for the environmental consultants and the climate change councillors, they pay for the general staff anyway (including for the time they spend ignoring their actual job trying to dream up carbon cutting measures), and what happens if one of these people actually comes up trumps and contributes something that makes a saving? Well we give them some more cash from the public purse. Perhaps the council needs to establish what qualifies as an actual saving after all this expenditure has been taken into account? Without intending to insult the intelligence of Coventry City Council general staff, I doubt many of them are scientists specialising in climate change or environmental issues, and therefore many of their suggestions are more than likely going to be lifted from the internet or picked up from another external source, so why can’t those who are receiving taxpayers’ money to investigate climate change issues do the research, save the other 17,000 the time, and save local residents the cost of this ridiculous hotline?